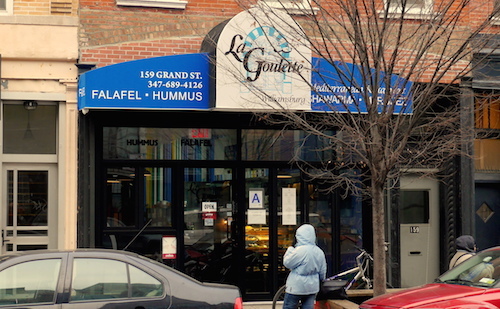 While Tunisian food does not separate itself much from Mediterranean cuisines further to the east, La Goulette seems to be the first restaurant I have seen in New York City that takes an active interest in calling itself specifically from this small North African country. 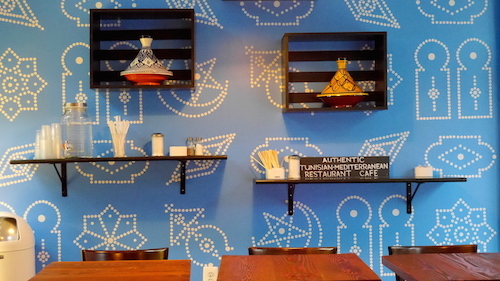 It adapts that pan-Mediterranean blue and white theme and makes a special restaurant in Williamsburg of all places, an informal counter and dining room. Order from their colorful menu boards and take a seat and wait to be called. The wait might be more than most counter establishments, but that only seems a result of the complex dishes served here, all of which seem to come out very fresh. 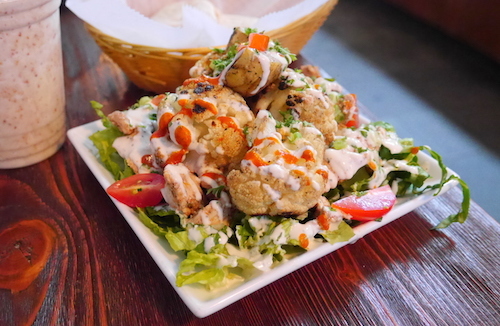 Dining alone, I settled on a dish that gave me as much of an assortment as I could get, the roasted cauliflower + artichoke over chicken shawarma ($10, below). Often in Lebanese or similar Mediterranean counters, I cannot resist the allure of roasted cauliflower in the case, but inevitably it disappoints me in its limp coldness. In this dish (and the $5 side that is served without the bed of chicken), the vegetables are warm and fresh, with burnt edges from the grill. The shawarma is a softer (almost mushy?) cut of chicken than found on a spit, but is delicious. The whole thing could benefit from a healthy dose of toum, the garlic sauce native to the Levant, but alas is not widely used in Tunisian cuisine. The counterman will ask if you want your dish spicy, and saying yes is confirmed not to be dangerous in the least. Obviously alcohol is not served here, and I decided for a cold beverage rather than tea. 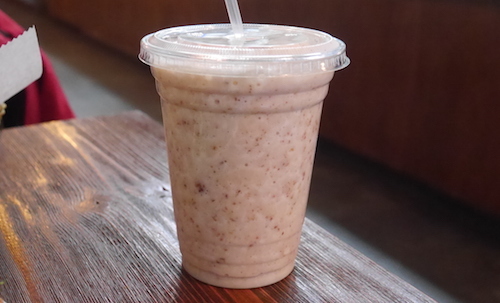 The La Goulette smoothie ($5, below) is banana, dates, and milk as per the menu, but has a fair helping of honey to give it a good sweetness. I taste a lot of banana, and the smoothie is good, but I would possibly ask for a higher date quotient next time since it is made fresh. The small zone of the same name in Tunisia serves as the port of entry for Tunis, the capital of the country. 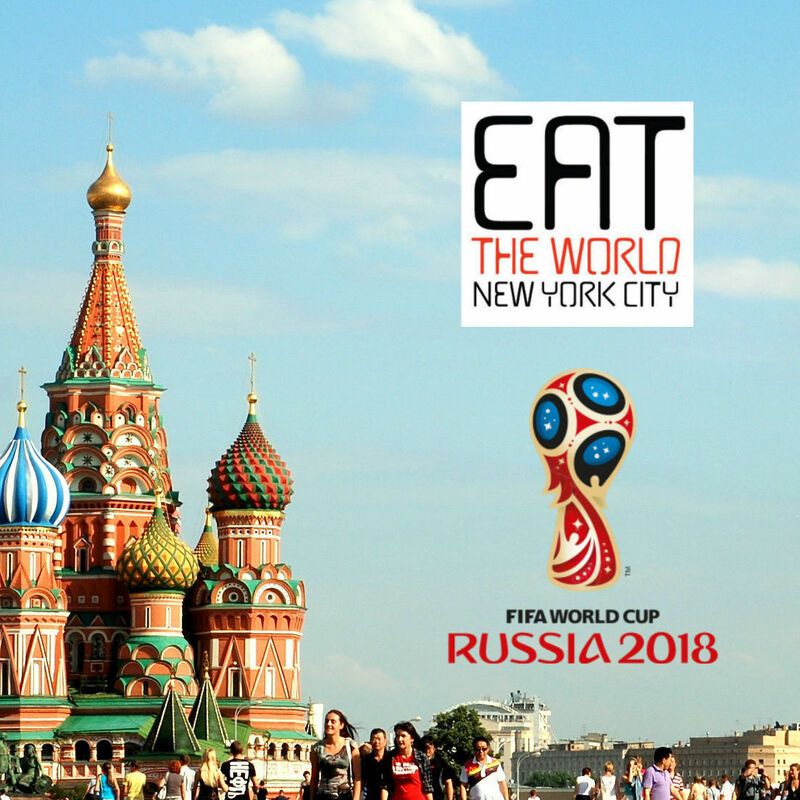 This is a good metaphor for the first restaurant of its kind here in our city, a wonderful place to start.